Ensure better health and healthcare while lowering costs by complying with patients’ treatment preferences. In the U.S. healthcare market, all stakeholders want the same outcomes. Which is: Better quality. Lower costs. Higher patient satisfaction. That’s especially true for accountable care organizations (ACOs) and health-plan providers. Yet, many ACOs and health plans still use a mountain of paper forms to document patient information, including patients’ advanced care planning directives. Because paper forms are not easily transportable across organizations and plans, they can lead to any number of errors, unwanted/unnecessary care, and wasted costs. Care Directives’ Advance Directive Information Exchange (ADiE) promises to change all that. 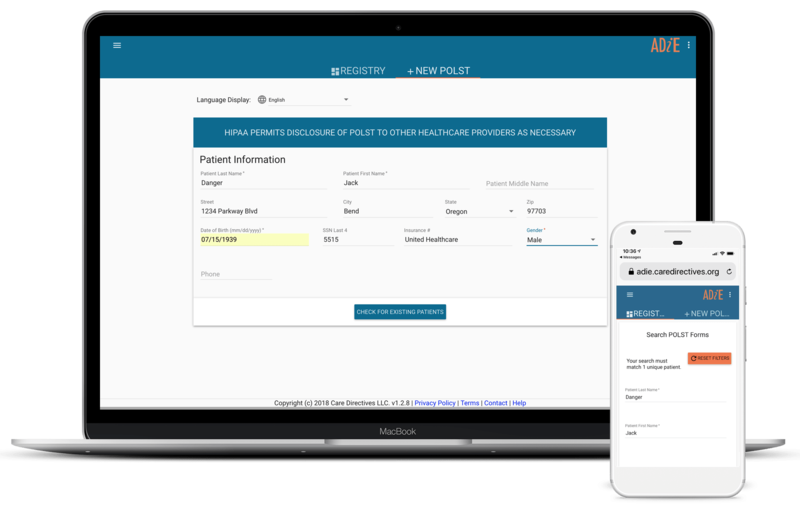 ADiE provides ACOs and health plans a powerful, cloud-based and centralized turnkey repository for patients’ documented care wishes. Consequently, it collects and stores a variety of advanced care planning forms, including Physician’s Orders for Life-Sustaining Treatment (POLST)/Medical Orders for Life-Sustaining Treatment (MOLST), Advance Directive, and other end-of-life care planning documents that can easily move across different ACOs and health plans in the care continuum. As a result, there are fewer unwanted admissions, fewer errors, and fewer costs involved with end-of-life care planning. Studies show that for every dollar spent on ACP there is a 100% ROI. Cost of care reduction in the last two years of life due to elimination of unwanted care. Decrease in hospital care intensity in the last two years of life. Reduction of decedents spending seven or more days in ICU/CCU during the last six months of life. Reduced inpatient days in the last two years of life.